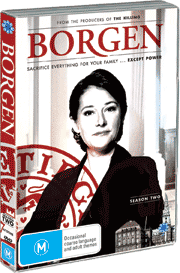 We follow Denmark’s first female Prime Minister Birgitte Nyborg (Sidse Babett Knudsen), her cynical spin doctor Kasper Juul (Pilou Asbæk), and the ambitious and idealistic television journalist Katrine Fønsmark (Birgitte Hjort Sørensen). Their lives are woven together in a complex fabric, as they each face various professional and private challenges. Birgitte Nyborg has been Denmark’s Prime Minister for two years – years that have taken their toll on her private life. She must now balance her role of PM with that of divorcée and single mother. Politically she has succeeded in earning the respect of her political allies as well as enemies, but tensions between parties are mounting. Denmark’s participation in international wars as well as certain central domestic policy issues are driving a wedge through the parliament and forcing Birgitte to make more and more shaky compromises. The building pressure causes her to doubt whether she can maintain both her position and her integrity. Cast : Sidse Babett Knudsen, Birgitte Hjort Sørensen, Pilou Asbæk, Mikael Birkkjær, Lars Knutzon, Søren Malling, Peter Mygind, Bjarne Henriksen, Benedikte Hansen, Ulf Pilgaard a.o.